Shubham is a Java Backend and Data Analytics Engineer with more than 3 years of experience in building quality products with Spring Boot, MongoDB, Elasticsearch, MySQL, Docker, AWS, Git, PrestoDB tools and I have a deep knowledge and passion towards analytics, Micro-service based architecture, design patterns, antipatterns and software design thinking. In this post, we feature a comprehensive Tutorial on MySQL Triggers and how do they work. MySQL is one of the most used SQL databases in many of the world-enterprise applications due to its ability to manage transactions and the ACID-behaviour which is built into its core. One of the reasons MySQL is so popular is due to the easiness it provides for its usage and its related commands. In the open source web application framework LAMP (which consist of Linux, Apache, MySQL and PHP), MySQL server is a central & important component. The MySQL Database server is written using C and C++ which internally uses a lexical analyser to parse and understand the SQL queries. For this lesson, we need to have a complete MySQL Server installation so that we can run examples for the Triggers we create. 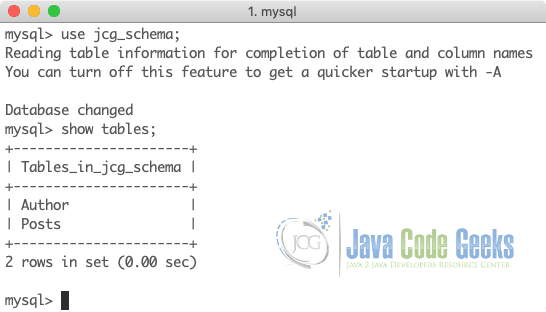 Please go through the MySQL Server Tutorial lesson to understand how installation can be done with some simple commands to get started with MySQL Triggers. 2. What are MySQL Triggers? MySQL Triggers are simple programs (written in SQL itself) which are executed automatically when something happens. This event can be a simple insertion, update or a delete operation in a Table. Whenever there is an event on a Table for which a Trigger is defined, the program is executed by the MySQL server to do something else as well. This can be any operation which related to keeping the database state consistent or populating a table with a set of events which happened in the update of the table. If we want to make sure that database integrity and consistency is maintained, Triggers can become quite long and coupled with application logic and still can’t replace all validations which are needed at an application level. Triggers work completely behind the scene. For this reason, it is not possible to figure out everything which happens at the database layer. If there are too many triggers at the database level, they can block database transactions which are originated from application level until a trigger is complete. It is possible that we want to trigger an operation only when an event happens 10 times or 100 times. This is not possible with SQL Triggers as they are stateless in themselves. BEFORE INSERT is triggered before data is inserted into the associated table. AFTER INSERT is triggered after data is inserted into the associated table. BEFORE UPDATE is triggered before data in the associated table is updated. AFTER UPDATE is triggered after data in the associated table is updated. BEFORE DELETE is triggered before data is removed from the associated table. AFTER DELETE is triggered after data is removed from the associated table. Before MySQL v5.7.2, it was not possible to define multiple trigger events for the same trigger event but now it has been made possible. Note that a trigger is only triggered with INSERT, DELETE or UPDATE statements only and not for any other statement like TRUNCATE etc. But again, there are statements which use INSERT statement behind the scenes such as REPLACE statement or LOAD DATA statement. If we use these statements, the corresponding triggers associated with the table will be triggered. We can back up the MySQL triggers by copying the trigger files to the backup folder or at any other place we wish to. We can also treat the trigger folder as a VCS repository and take its backup whenever something changes. CREATE TRIGGER statement marks the beginning of a Trigger definition. It is good if the Trigger name follows a specific naming convention [trigger time]_[table name]_[trigger event] like after_author_added. A Trigger can be invoked AFTER or BEFORE an event occurs which must be defined after a name is provided for the Trigger. trigger_event can be INSERT, UPDATE or DELETE. Once one of this happens, a Trigger is invoked. On the second line, we provide the table name with which this Trigger will be associated. This is mandatory to be done as a Trigger without a Table cannot exist in MySQL. An SQL Trigger starts with a BEGIN statement and end with an END statement. Between these statements, we define the logic for the Trigger. There is an important thing to notice here. We can get properties of the row being affected through the NEW keyword. Timing column can contain only two values, BEFORE or AFTER. It specified when is the trigger invoked. We see that the insertion was done in the audit table as soon as we inserted a new author into the table. Triggers are really fast when you want to perform table manipulation right before or after an operation is done on the table. Please note that if we want to modify a Trigger, we will have to delete it first and recreate it again with the new commands. Unfortunately, there is no command like ALTER command for modifying SQL Triggers. In this post, we looked at how we can create triggers for three trigger events in MySQL, including how we can associate them with a table in our database. We also looked at how we can display all the Triggers which exist in our database along with 8 columns in the table which is managed by MySQL itself for administration purposes. One thing to take care when you replicate the database to a new server with only the content from your tables, the Triggers won’t be backed up if you do not take a complete database back up carefully and your database will start to become inconsistent as soon as data manipulation starts in it. 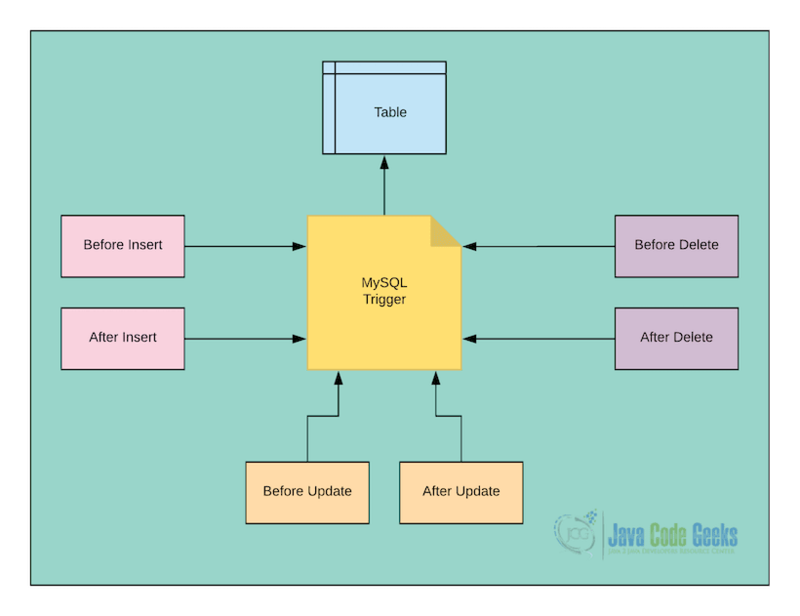 MySQL Triggers are a very powerful tool with very high performance (usually) but the bad thing is that they can grow very large very easily and quickly once your application starts to grow. The main database consistency should be managed at the application level wherever and whenever possible. Still, MySQL Triggers make a very good companion if you are a database administrator and just want to make things consistent without relying on too much code because after all, the performance of a Trigger is very high because database operations are very fast on the database server itself. We did not cover all the SQL Trigger sections in this lesson but we did provide a very strong foundation on how Triggers can be created and used to manipulate data in a database. Don’t forget to check the examples of using Java with SQL: JDBC Best Practices Tutorial and Java JDBC ResultSet Example. 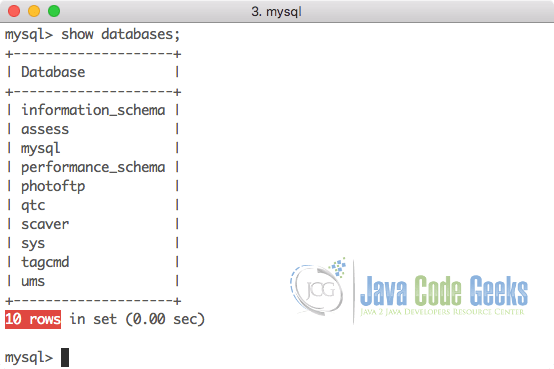 These lessons explain how to effectively use SQL commands with Java & JDBC drivers. There are many more examples present on MySQL which can be studied for a deeper understanding of the database.